Many South Africans travel to exotic destinations off the African coastline like Mauritius, Seychelles and the Comores to experience tropical holidays not realizing that a paradise, offering all the beauty and tranquillity and more than some of the Indian Ocean Islands, borders South Africa, less than 600 km from Gauteng. Nestled between South Africa and Tanzania, on the south-eastern coast of Africa lies the tropical paradise of Mozambique. The 2500-km long coastline with white palm lined beaches, pristine crystal clear waters, lagoons and spectacular corral reefs, is one of the most popular holiday destinations on the African continent. This magnificent coastline with its secluded unspoiled beaches is scattered with stunning resorts that blend in with the natural beauty of the region. With its all year round summer climate and safe beaches this paradise offers unforgettable family holidays and for the adventurous many activities, especially fishing, diving, snorkelling and sailing as well as peace and tranquillity for those who just want to laze around on white tropical beaches and enjoy life. Magnificent sunrises, calm lukewarm waters of the Indian Ocean, excellent cuisine and friendly people await those who want to discover this tropical paradise called Mozambique. A video by Adventure Films called "Discover Mozambique" must be the most comprehensive audio-visual tourist guide available covering the coastline from Ponta do Ouro in the south all the way up to Inhassoro just south of Beira. The viewer will experience, with superb video and audio quality, the beauty of the resorts on this part of the coastline. Places like Ponta du Ouro and Malongane, Mamoli, Marracuene, Macaneta, Bilene, Xai-Xai, Chongoene, Chizavane, Chidenguele, Zavora, Paindane, Guinjata, Jangamo, Coconut Bay, Inhambane, Barra, Maxixe, Morrungulo, Pomene, Vilanculos and Inhassoro. This video is a must for all who plan to travel to Mozambique. Not only for a family holiday but also for scuba divers, snorkelers, fishermen either deep sea or surf, sailors as well as 4x4 enthusiasts. Mozambique is one of the worlds best kept diving, spear fishing and big game fishing secrets. With a coastline of over 2500 km, one only has to look at her neighboring exotic dive destinations such as Mauritius, Comores and the Maldives to understand what lies beneath the warm Indian Ocean – the most pristine and virgin reefs in the world with names like Bass City, Texas, Manta, Lighthouse, Jangamo, Playstation, Zambia Shoal, Sylvia Shoal and many more. A huge diversity of game fish abounds in the Mozambican waters including Sailfish and Marlin. This coastline is also famous for huge Kingfish catches. 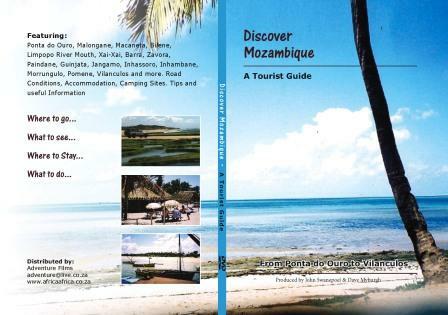 "Discover Mozambique" is the ultimate guide for planning your trip to this tropical paradise. It covers all the resorts on this part of the coastline by showing all the lodges, hotels and campsites where you can enjoy an unforgettable holiday experience. It offers handy information on road conditions, beaches, dive camps and other activities and tourist attractions.